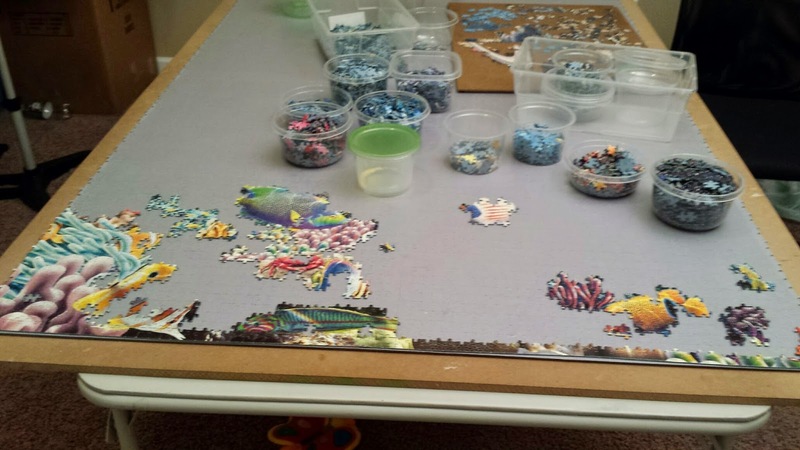 Section 3 is well underway, even though I have not posted anything recently, I have been getting in some good puzzling time. 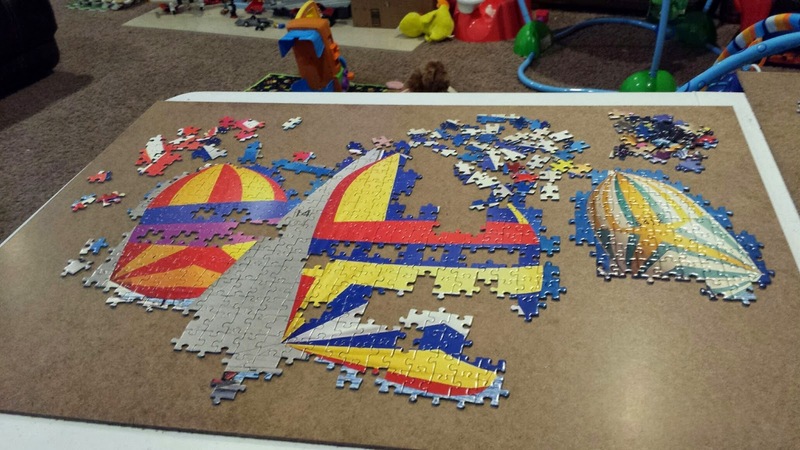 I got some new "working boards" that are small, but sturdy and have really allowed me to work on the puzzle in the evenings while still spending time with Randy. Good start on the fishies! 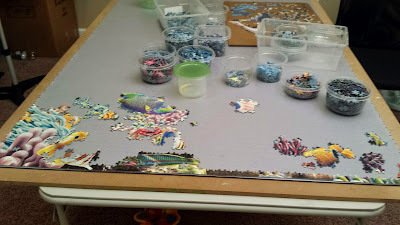 I just bring up one or two of the small working boards, and a particular bucket of pieces and work in the family room next to where Randy is sitting. 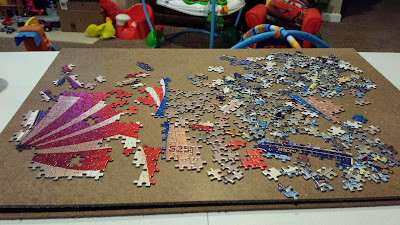 We are able to watch TV together and talk while I puzzle. It has been working out great. I have already made some great progress on some of the fish, three of the big boats, and the two largest planets. This whole month has been, and continues to be, extremely busy for us. We have had lots of things to do every weekend (both days usually) so I haven't had much time to work on it other than for an hour or two most weeknights, but every little bit helps, and I am hoping that the goal I set for myself...to finish in half the time it took me to do Section 2 is doable. Based on my Section 2 statistics, my goal date of finishing Section 3 will be - October 18th, 2014. That will be 6 months and 5 days which is exactly half of the time that Section 2 took. 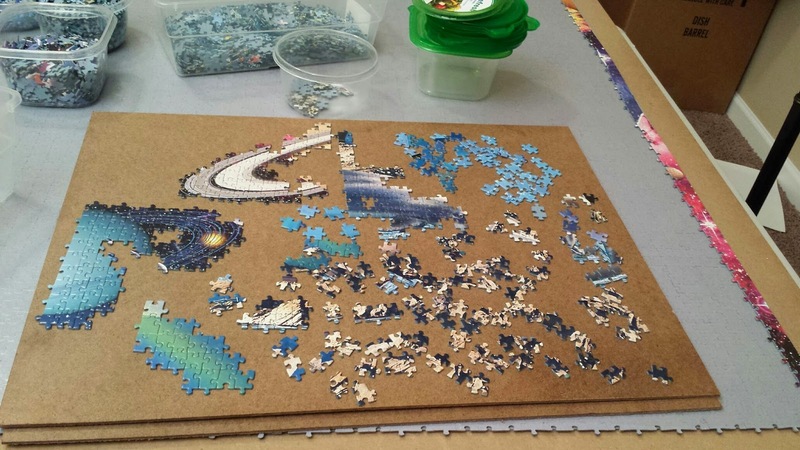 Planets and rainbow starting to take shape.